International Journal of Research in Health Sciences,2015,3,4,493-497. 1Assistant Professor and 3Associate Professor, Department of Pathology and 2Associate Professor, Department of Microbiology Great Eastern Medical School and Hospital, Srikakulam, Andhra Pradesh, INDIA. Introduction:Chronic suppurative otitis media is characterized by chronic inflammation of the middle ear and mastoid cavity with persistent or recurrent discharge through a tympanic membrane perforation. 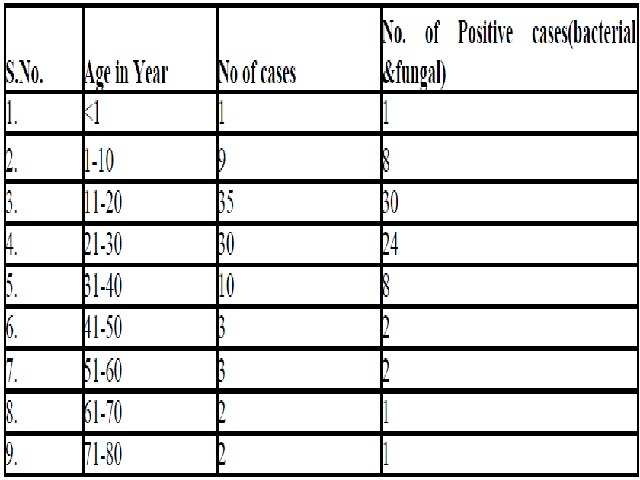 The current study was designed to classify bacterial isolates related with CSOM and their Antibiogram in patients attending ENT OPD of Great Eastern Medical School & Hospital, Srikakulam. Materials and Methods: Samples were taken from 95 patients (both male and female) in all age groups during the period of Nov2014 to Oct 2015 suffering from CSOM and having active ear discharge. Their Gram staining, direct microscopy with KOH, Culture sensitivity, and Biochemical tests were carried out to recognize the organisms and to identify their sensitivity pattern. Drug susceptibility testing was conducted using a modified Kirby Bauer disk diffusion method. Results: The frequent primary organisms isolated were Pseudomonas aeruginosa 40 (42.1%) followed by Staphylococcus aureus 23 (24.2%) amongst the 83 (87.3%) bacterial isolates (including 10 isolates of MRSA). Fungi accounted for 4 (4.2%) of the isolates while 8 (8.4%) were culture negative isolates. The antimicrobial profile of the major isolates i.e. Pseudomonas and Staph. Aureus revealed maximum sensitivity to Piperacillin / Tazobactum against 90% isolates. Conclusion: Pseudomonas aeruginosa is the main frequent isolate followed by Staphylococcus aureus. Both of these are responsive to Piperacillin / Tazobactum. The study of microbial pattern and their antibiotic sensitivity determines the widespread bacterial organisms causing CSOM in local area and to start practical and more targeted healing of otitis media and its complications for successful outcome, thus to prevent the emergence of resistant strains.